Julia Szusz didn’t take the most typical path to scientific research. After finishing high school in New Hamburg, Ontario, she worked in restaurants, in retail and at a gas station. When she decided she wanted to go to university, she took high school science courses online, meaning she had never stepped foot in a lab until she arrived at Wilfrid Laurier University at the age of 21. Four years later, Szusz has just finished her Bachelor of Science (BSc) in Biology – and recently won a Canadian Society of Microbiologists undergraduate award, one of only six awarded across the country. She now aspires to become a medical researcher. Szusz’s path toward research really began when she took a biochemistry course with Associate Professor Geoff Horsman in her second year. She did well – so well that Horsman emailed her to see if she’d be interested in discussing opportunities to do research in his lab. Szusz did a co-op term in Horsman’s lab in the summer after her second year. She started off just learning basic lab techniques and ended up excelling at the work. 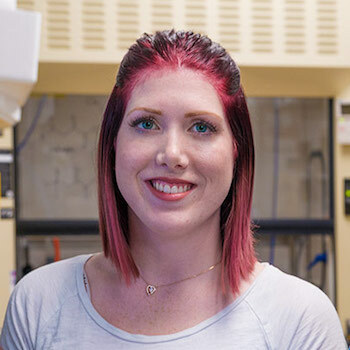 “I think Laurier’s small environment is great for giving you opportunities to get involved in research in undergrad and to be able to take on significant roles and responsibilities." She stayed on to volunteer part time at the lab throughout her third year and returned full time the next summer, this time with a prestigious Undergraduate Student Research Award from the Natural Sciences and Engineering Research Council of Canada. In her fourth year, Szusz did an honours thesis with Horsman, continuing the work she started in her second year. The work at Horsman’s lab, with which Szusz has been intimately involved, focuses on using enzymes to efficiently and sustainably make biologically active molecules such as pharmaceuticals and pesticides. Almost all biological molecules are chiral – a word derived from the Greek for “hand,” describing three-dimensional objects that are mirror images of each other, like hands. “Left” and “right” molecules can have different effects, so making optically pure molecules, which means only “left” or “right” molecules are present, may be critically important. For example, the drug thalidomide is a mix of “left” and “right” molecules – though rather than left and right, organic chemists use the prefixes R and S. In the case of thalidomide, the R molecules have therapeutic effects including nausea relief, which led to the drug being widely used to combat morning sickness during pregnancy. However, the S molecules cause severe birth defects in children. When biological molecules are synthesized in a lab, scientists typically end up with a 50/50 mixture of “left” and “right” molecules, says Szusz. To try to solve the problem, Szusz and Horsman are working with enzymes, which are protein molecules that work to speed up biochemical reactions that result in a product. Specifically, they are working with epoxide hydrolases, a class of enzymes widely found in nature. Szusz has been working to identify and engineer enzymes that will act on specific molecules – substrates – to generate optically pure molecules.